Feed the caffeine-loving mad scientist within, with the OXO Cold Brew Coffee Maker. Resembling something you might find in a chemistry set, this slightly transparent tower has one mission and one mission only...to brew you a delicious carafe of cold brew concentrate. To begin the process, simply add 10 oz (or 3.5 cups) of your favorite ground coffee. Pour 40 oz of water over the Rainmaker top for full water dispersion. Gently stir and let your concoction "steep" 12 - 24 hours, or overnight. In the morning, simply place the glass carafe under the cold brew tower, flip the Brew-Release Switch and, depending on the size of your grind, allow approximately 20 minutes for your fresh concentrate to fully drain. Use the carafe stopper to easily measure out 2 oz of freshly brewed concentrate and mix hot or cold water or milk to create your favorite drink. Fine Reusable Filter: The super fine reusable filter is great for keeping the ground coffee in the brew container and out of your concentrate. Simply unscrew the filter cap to access the stainless steel mesh filter for an easy rinse after each cold brew cycle. Rainmaker: The removable brew container lid features a variety of holes that create a rain-like effect when water is poured over the top to saturate the grounds. This effect allows the grounds to be evenly saturated, while not oversaturating and allowing space for your grounds to bloom. Brew Release Switch: Located front and center of the cold brew stand, keep the Brew Release Switch in an upright position during the steeping process and flip the switch down when you're ready to drain your freshly brewed concentrate. Glass Carafe: The laboratory flask-like borosilicate glass carafe features measurement lines that offer the ability to measure in cups, ounces and milliliters. Carafe Stopper: The glass carafe stopper doubles as a measuring cup for your concentrate. OXO suggests filling the carafe stopper with concentrate up to the measuring line, which is approximately 2 oz. Pour into a glass and dilute with water, milk or ice to create your favorite cold (or hot!) coffee concoction. Simply Delicious - Tasty cold brew that's practically fool-proof to make! Can you dig it? 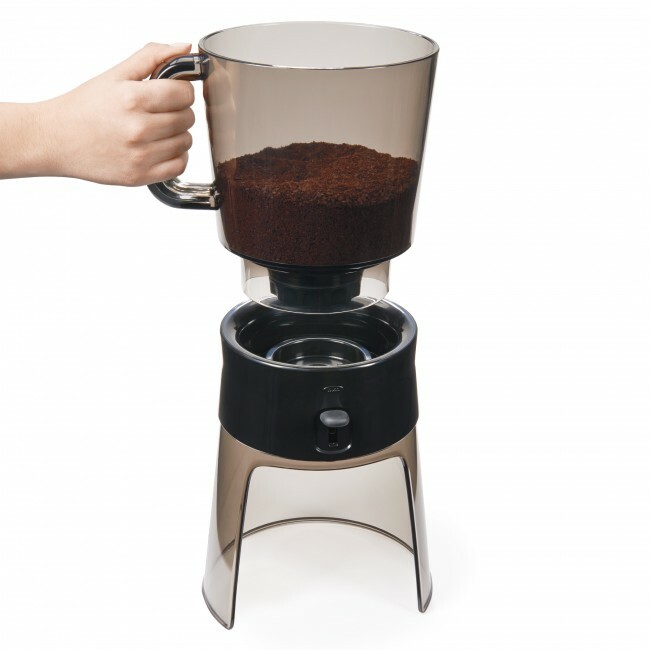 Storability - When not in use, the OXO Cold Brew Coffee Maker can be constructed into a compact and portable unit. Flip over the brew stand and place the brew container in the legs of the stand. Place the glass carafe and stopper in the brew container and top it off with the rainmaker. 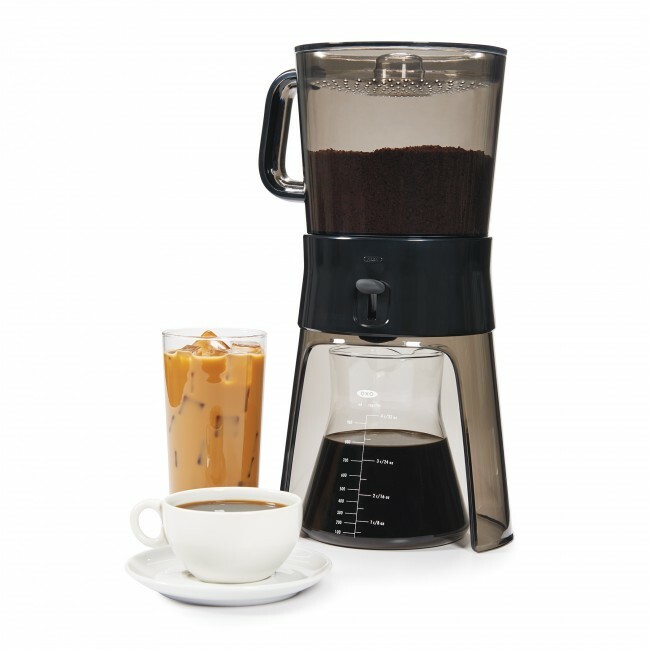 BPA Free - The OXO Cold Brew Coffee Maker is proudly BPA free. Plastic - The plastic used to create the OXO Cold Brew Coffee Maker is neither aesthetically pleasing, or super durable. 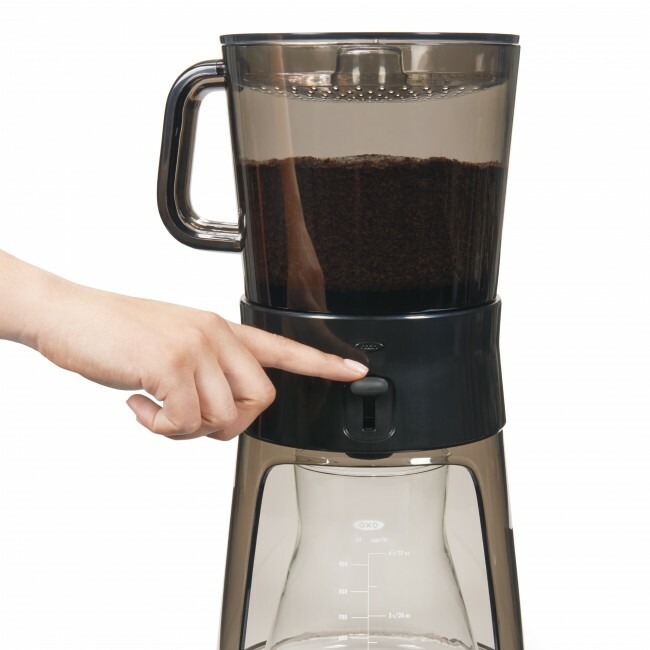 However, this cold brew coffee maker will definitely get the job done by producing a smooth and tasty concentrate. The OXO cold brew coffee maker provides a super simple way to make a generous amount of cold brew concentrate. Possibly one of the simplest cold brew systems we've encountered! 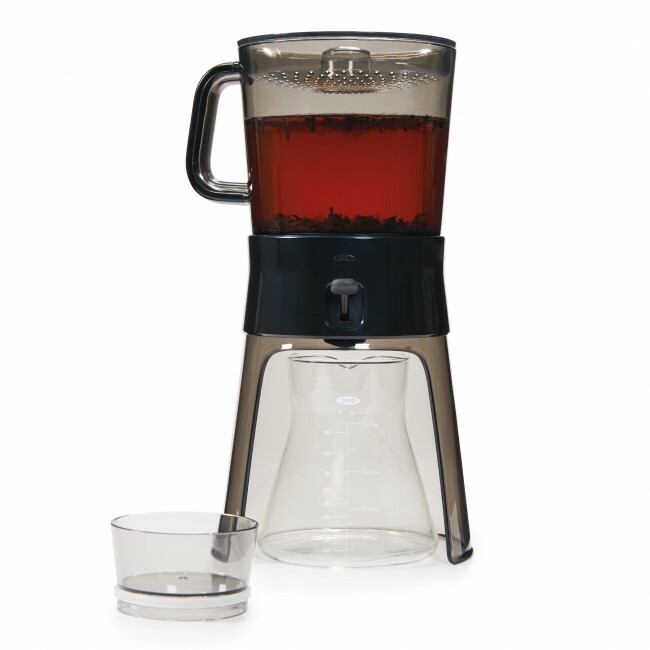 The OXO Cold Brew Coffee Maker can also be used to cold brew tea!